Journalism – Page 2 – Grammargeddon! The answer is: Both. Yes. Either. Doesn’t really matter. I told you you probably wouldn’t like the answer to that question in my last blog post. But did you read it? Did you listen? Do I sound like your mother? Hi, folks! I haven’t been too present on the blog lately. I was away for much of last week on a family vacation, and tomorrow I’m heading to GenCon to see old friends, but I recently found* two typos that I had to share. Consider them snacks to tide you over until a real post comes along. First, you’ve heard of Porsche, right? Their cars ain’t cheap, so you’d figure the company would have a little money to invest in producing great ads. However, they seem to have skimped on the proofreading in this series of billboards promoting their Boxster. I always say if you’re going to misspell the name of your own product, you might as well do it big. Next up is this obituary, which contains a hilariously inappropriate acronym in the photo caption. Apparently, some folks on Twitter have called this the “worst caption fail of all time.” I really don’t know how this particular error can be explained. You’d have to go out of your way to make this mistake. One theory is that the caption writer meant to signify “lots of love,” but that just makes me LOL. I often read Kevin Drum’s blog at the Mother Jones website and felt like sharing a great typo he found in the Washington Post. 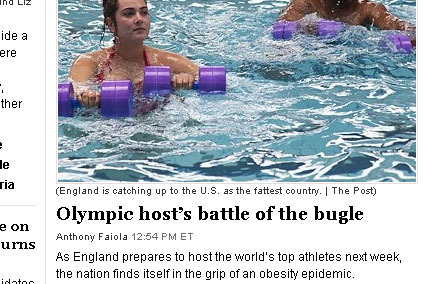 The original story has since been updated on the Post‘s website, and Karen and I usually don’t spotlight errors that have been corrected—we don’t want to seem like rabid editors chasing down every typo ever made—but the idea of a bugle battle at the Olympics was too good to pass up. And, of course, this is yet another example of a mistake that a spellchecker wouldn’t (and apparently didn’t) catch. The other night while I was reading my RSS feeds and keeping an eye on the Twitter feed as well, I saw a Tweet from Lisa Lillien (aka “Hungry Girl,” of cookbook and website fame). Her comment was “OMG!” (There may have been a little more, but the gist of it was still “OMG!”) Now, of course, the only place I can find the image is . . . It could be Photoshopped. Clearly it’s an image on someone’s flatscreen tv. However, when I saw the Tweet from Lisa, the photo was without an identifier other than the station’s ID in the lower right corner, and appeared to be from either her own cell phone (if she was traveling, it’s entirely possible–she’s LA-based, but this particular station is in the South Bend/Mishawaka IN area, aka “Michiana”) or someone else’s. Now, naturally, it’s found a home at the I Can Has Cheeseburger site, and looks just like it did when I first saw it a couple of nights ago. That still doesn’t answer definitively the question of Photoshop involvement. However: I also submit this as further support for the strong possibility that the error was actually broadcast, and was not created for amusement. Yes, it’s plain that the meaning is “air-conditioning.” But, come on, people. Would it have been that difficult to use the accepted shorthand “a/c” (or “A/C”) to be absolutely sure no one (like me) could point out the sloppy usage? No air for a week sounds far more serious to me than living without air-conditioning. Because, y’know, with no air, living is pretty difficult. It also doesn’t help (or hurt, depending on whose side you’re taking) that I have a passing familiarity with this particular station, and I’ve seen stupid errors like this one on the air before. This marks the first time one’s made it to the national awareness, as far as I know. I’m not sure that’s entirely a good thing.